While cars make a variety of noises, some of them can indicate a serious issue and should be checked immediately. Differential noises can quickly lead to expensive repairs or even failure if not addressed quickly. Let’s have a look at exactly what a differential does as well as what some troubling noises may indicate. What does a rear differential do? The rear differential creates torque in the crankshaft which is distributed via the transmission to the drive shaft and finally to the wheels. Basically, the differential transmits the power produced by the engine to the wheels. However, it allows them to have different rotation speeds. This is actually why this specific part is called a “differential”. It can distribute different speeds to the various wheels, which is particularly important during a turn. When turning, the pair of wheels that drive the car do not turn at the same speed. The inside wheel rotates at a slower speed than the outside wheel and the rear differential is what helps make this happen. The rear differential has a number of spider gears and bearings, which can rotate the wheels at different speeds. The rear differential helps determine the speed that the axle and wheels turn in relationship to the drive shaft. This is called the ring and pinion ratio. As an example, a gear ratio of 3.75:1 means that the drive shaft will rotate 3.75 times to the wheels making one full rotation. A rear differential is a complicated component that is full of gears and other parts that can fail. They can fall out of alignment or become damaged. This will lead to a variety of different noises. Let’s look at some of the more common noises that could signal trouble in the rear differential. Rear differentials are complicated and are composed of numerous gears that work with each other. When gears are damaged or go out of alignment it can lead to numerous issues ranging from minor to serious. Noises coming from the differential will usually indicate a problem. You should pay attention to those noises and address them immediately. A howling or whining noise can happen at different speeds and can indicate different issues. Regardless of when it occurs, it is a signal that your differential gears are starting to wear. If the howling noise only shows up during deceleration, there is a good chance that the pinion-bearing preload has become loose and needs to be adjusted and re-tightened. It can also indicate a bad pinion bearing or ring. In this case it would have to be replaced. On the other hand, if the howling happens when the car is accelerating, over a variety of speeds, it is highly likely that the pinion gears inside the differential are out of alignment or are starting to wear out. It can also indicate a worn ring. In a best-case scenario, the gears will need to be realigned and in a worst case they will need to be replaced. If the howling only occurs while accelerating at a specific speed or speed range it is likely that those specific gears are worn or are not being lubricated properly. Finally, if the gears in your differential have recently been replaced but you are still experiencing a howling noise, the gears may not be properly aligned or the preload may be wrong. Immediately take the vehicle in for repairs to prevent further damage. These noises are usually associated with worn carrier or pinion bearings. A rumbling or whirring sound will usually happen at speeds above 20 mph. The sound may change while turning, especially if the vehicle has a C-clip axle. A whirling or rumbling sound can occur at a variety of speeds and during acceleration or deceleration. Pinion bearings that are worn out and need replacing tend to make a whirring sound more than a rumbling sound. This is because they turn much faster than the carrier assembly and bearings. 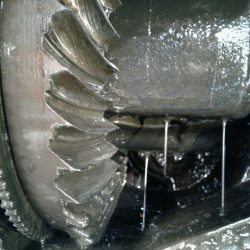 Once a bearing reaches a certain point of wear, it moves into the failure stage. It will often make a howling noise instead of a whirring sound. You should have your vehicle checked immediately if you hear a howling noise, regardless of whether it is during acceleration or deceleration. A rumbling noise while turning is often related to a bad wheel bearing. This should be inspected and repaired as soon as possible as the problem will only get worse and more expensive. This is often the sign of a serious problem such as a broken or chipped gear. A clunking noise should be checked out as soon as possible. A clunking noise that repeats itself every few feet is usually an indicator of a chipped or damaged ring gear or possibly a broken pinion gear. Banging or clunking noises, especially during turning can also be due to broken spider gears, worn limited slip clutches, a worn posi-traction or a lack of lubrication in the posi-traction system. If you hear a loud crunching sound this may be related to a broken spider gear. This is a serious issue and should be repaired immediately. Crunching or clunking that only happens during acceleration or deceleration often points to a chipped gear tooth or a missing high spot on a gear tooth. Again, this should be inspected and repaired as soon as possible as it can quickly lead to a much more expensive repair. Unless you are a professional mechanic the only thing you should do is get your vehicle to a repair shop. Differentials are very complicated systems and inspections and repairs should be left to a professional. Noises coming from the rear differential or any part of the transmission system can quickly spiral into major repairs if you ignore the initial noises. Proper maintenance and inspections can dramatically lengthen the life of a rear differential. Proper lubrication is extremely important and can help prevent broken and chipped gears. The best advice is to have your transmission system inspected on a regular basis. Repair any issues as soon as you notice them to prevent them from becoming a major issue. For free and fast advice call us or email today!